In 'A stitch in time', EC Davies is showing a selection of new works including video, animation, print, photographs and sewn objects. Davies works with images of herself and found objects that reflect and communicate aspects of her thought processes through the act of making. Davies creates a selection of characters using her self as the prototype, each of whom performs different functions within an imaginary space. The characters have specific roles within her practice. They can be obsessive in their pursuits, some of which include sewing and cleaning. They hoard found objects: fabric remnants, fortune cookies and voice recordings from films, and transform them into works of art. Her characters come from another realm, they follow no fashion rules, but are highly stylised. 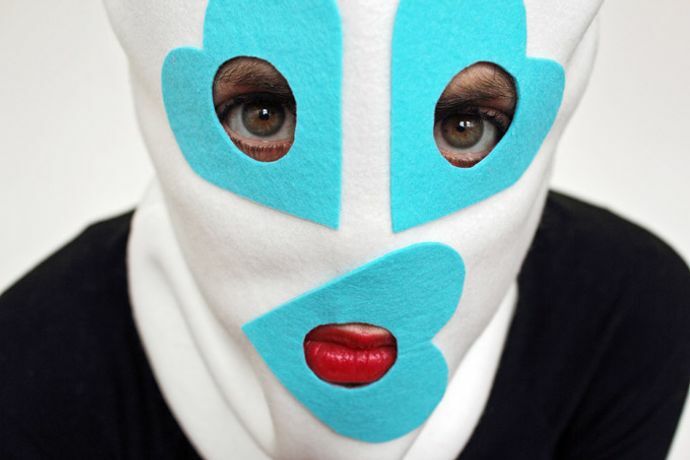 They wear an array of playfully designed balaclavas and dresses. Davies documents these characters in a mock anthropological fashion, filming them, naming them and characterising them. 'A stitch in time' explores universal themes of love and loss ' sometimes playful, celebrating life; sometimes melancholic, echoing feelings of loss and the desire to claw back what once was.